Astronomers use supermassive black hole and giant star near the center of our galaxy to show that the famous physicist was right about gravity. 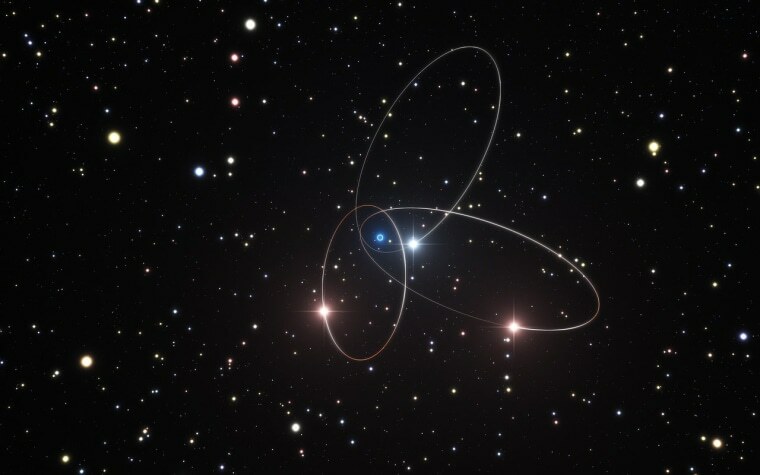 A group of astronomers in Germany and the Czech Republic observed three stars in a cluster near the supermassive black hole at the center of the Milky Way galaxy. Using data from the Very Large Telescope in Chile, among others, the researchers tracked how the stars moved as they went around the monster black hole. The position of the supermassive black hole at the center of our Milky Way galaxy, as well as the giant star S2, are shown (inset) in this near-infrared image from the European Southern Observatory's Very Large Telescope in Chile.The black hole's position is marked with an orange crossESO/MPE/S. Gillessen et al. "Most relativity tests are done with our sun and the stars, so they are in the 1-solar-mass or few-solar-mass[es] limit," Andreas Eckart, a professor of experimental physics at the University of Cologne in Germany, who led the research team, told Space.com. "Or with the [Laser Interferometer Gravitational-Wave Observatory] recently, that's a few 10s of solar masses." The stars used in the observations are so close to the black hole that they move at 1 or 2 percent the speed of light, Eckart said, and they approach to within only about 100 times the Earth-sun distance of the black hole itself, which is quite close by galactic standards, he said. (Pluto averages about 39 times the Earth's distance from the sun, which is about 93 million miles or 150 million kilometers). Using orbiting bodies to show relativistic effects is not new; observations of the planet Mercury in the 19th century showed that its movements deviated from what Isaac Newton's theory of gravity predicted. At first, astronomers thought they had evidence of another planet, which they dubbed Vulcan. Einstein was able to show in 1915 that relativity could explain the deviation. SPACE Will NASA's Ruined Apollo Mission Control Room Rise Again? Mercury's motions proved Einstein correct, but the sun's gravity is weak compared to that of a supermassive black hole. This is why Eckart and his team set out to see if Einstein's theory held up in a more extreme environment. While gravitational lensing, the bending of light by massive objects, shows that massive objects bend space, the recent research is the first time anyone has taken precise measurements of any object orbiting so close to a black hole. The measurement itself is not as precise as it might be, Eckart said. Future work will get a better read on the stars' positions and narrow down the result. He said one plan is to get better spectrographic measurements, which would reveal S2's movement more precisely.